What goes in the Cream of the Crop Pool? Your best pictures. Every member can submit one picture in each of THREE basic categories. Please see the Rules Page for a full explanation of the group's posting rules. PLEASE NOTE: To allow for the fact that the group originally had different submission guidelines, the group is set to a total of 7 images per member. If you already have 7 images, you may need to remove an image from one of the no longer used categories to add another. If you are a new member, you are limited to the current categories only (e.g. you can't add a photo tagged "COTC:bestof2005"). Descriptions and/or Tags are the KEY to this group! Please be sure to add a DESCRIPTION and/or TAG to your image as directed in the instructions below. Submissions without descriptions and/or tags will be DELETED without warning. If your image disappears from this group, forgetting the description and/or tag is probably why. 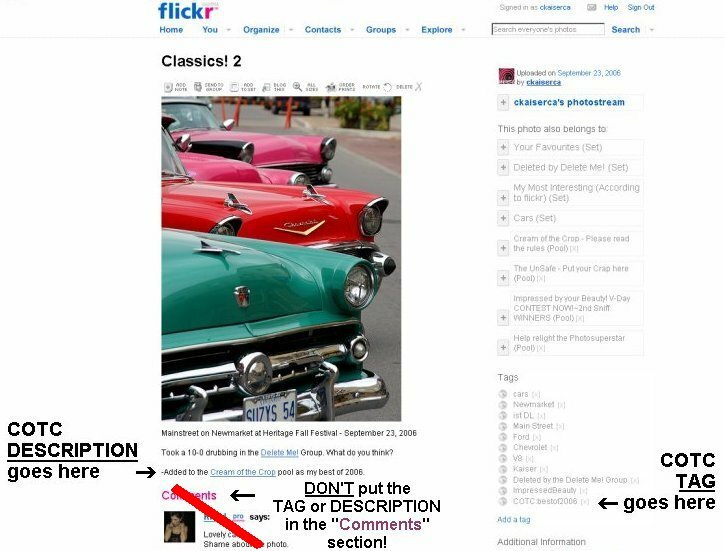 People ignoring descriptions or tags completely on all of their images may also be removed from the group without warning. Description: -Added to the Cream of the Crop pool as most favorited. -Added to the<a href="https://www.flickr.com/groups/cotc/">Cream of the Crop</a> pool as most favorited. Description: -Added to the Cream of the Crop pool as most interesting. -Added to the<a href="https://www.flickr.com/groups/cotc/">Cream of the Crop</a> pool as most interesting. Description: -Added to the Cream of the Crop pool as my personal favorite. -Added to the<a href="https://www.flickr.com/groups/cotc/">Cream of the Crop</a> pool as my personal favorite. Description: -Added to the Cream of the Crop pool as my best of 2008. -Added to the <a href="https://www.flickr.com/groups/cotc/">Cream of the Crop</a> pool as my best of 2008. Please note where the Descriptions and/or Tags should go! Members can post 7 things to the pool.